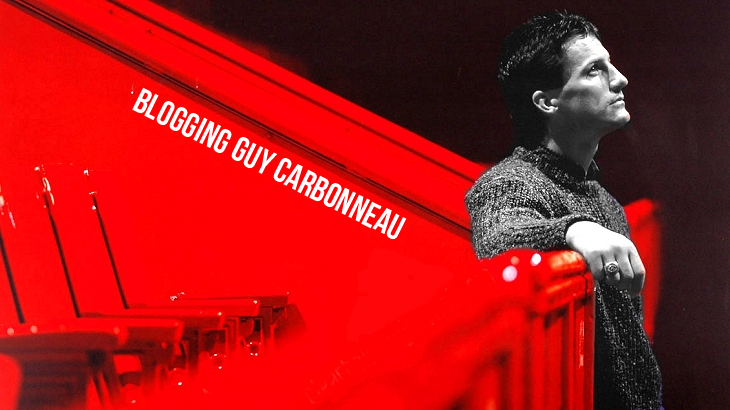 Anyone who's been reading this blog for any length of time knows that I have a weakness for Carbonneau game-used stuff. I've been able to obtain a few pieces of my own, but before then I thought that the game-used hockey card market afforded an excellent opportunity for those who might not otherwise be able to own a piece of game-used memorabilia, even if such memorabilia had to be destroyed to do so. There's nothing quite like owning something that your favorite player actually used on the ice, is there? I did have a feeling of uneasiness when thinking about the memorabilia being destroyed. Until this year when I finally obtained one, a game-worn Carbo jersey was my white whale of collecting and it made me a little queasy to think of these jerseys being cut up to make cards. I had managed to convince myself that most of these were "one-game wonders," or photo shoot jerseys. It's not a jersey, but it is most definitely a piece of one of Carbo's vintage Artis sticks, with the stick tape still attached. Seeing this did make me queasy. In regards to Carbo game-used memorabilia cards, he really falls in the category of "vintage" players, and the school of thought in the game-used hobby is that cutting up vintage memorabilia is blasphemy. The thing is, there just isn't that much Carbo game-used stuff available anymore. Yes, he played for 18 years, but there really wasn't much of a market for those collectibles when he was playing, and heaven only knows where most of the stuff is now. That's why it's really a crime to destroy the vintage stuff for purposes of making cards, many say. But...it's either OK to cut up memorabilia or it isn't. Vintage or not. I saw an argument that the Hockey Hall of Fame doesn't display jersey cards and that's very true. You can make a million cards, but the actual memorabilia is in limited supply and when it's gone, it's gone. This, I think, holds true for today's game-used memorabilia as well. Yes, multiple sets of jerseys are supplied to players nowadays for the purpose of marketing them as collectibles later, and while this isn't a post about value, those jerseys are going to mean something to someone somewhere. I know how I felt when I finally got my Carbo gamer in my hands. Name anyone who's playing today, and there's someone out there who loves and respects them just as much as I do with Guy Carbonneau. That's why I'm not okay with memorabilia cards anymore.